Elle magazine called Belle Gibson 'the most inspiring woman you've met this year'. But her story wasn't quite what it seemed. Elle/The Whole Pantry - published here under Fair Use. 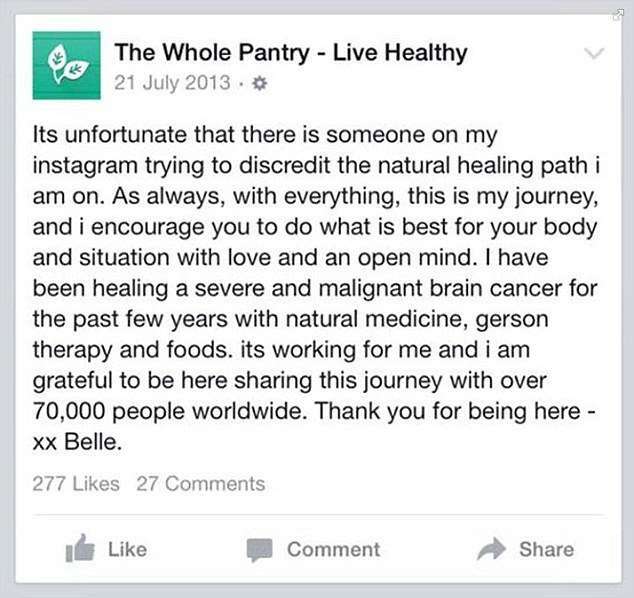 A "wellness blogger" who claimed she had cured her own brain cancer has just been fined AUS$410,000 (over US$320,000) for misleading her followers because she didn't ever have cancer in the first place. Belle Gibson began blogging in 2013, and launched an app – The Whole Pantry – as well as a book with the same title. Over 200,000 people downloaded her app within the first month of launch. She also began making a big impact on social media, with a large presence on Instagram and Facebook. On these pages, she made claims about her health, including that she had brain cancer and had "cured" it herself with natural medicine and "gerson therapy", an "alternative" therapy that claims (falsely) to be able to cure cancer and degenerative diseases through dietary changes alone. Belle's Facebook page, in which she shared her "journey". Facebook/The Whole Pantry. When Belle's book was published, however, people started to notice inconsistencies in her story. In the preface of the book, she said that she had been "stable for two years now with no growth of the cancer", but had posted on her Facebook page that her cancer had spread to her blood, spleen, and uterus. She claimed to have had heart surgery several times, and had even died on the operating table, but didn't have any scars. Soon the media questioned her claims, leading to her own admission to Australia Woman's Weekly that she has never had cancer at all. "None of it's true," she admitted. Gibson had claimed that she had cured her cancer through dietary changes and natural healing. Fingers crossed nobody followed her "path" because the only kind of cancer that can be cured with her methods is the kind you've entirely made up. The rest require medical treatment. Gibson has now been fined by the Melbourne federal court for misleading her readers in another way. She had claimed she was going to donate proceeds from her app to charity, but these donations never took place either. Among the fines imposed, totaling AUS$410,000, she has to pay $150,000 for failing to donate one week's app sales to the family of a boy who had an inoperable brain tumor. She has been charged for five separate contraventions of the Australian Consumer Law Act, all relating to her promises to donate to charity, which never materialized. Belle wasn't in court to hear the judgment against her this week, but acknowledged the judgment via email, the Guardian reports. 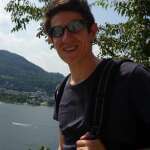 In his ruling, Judge Mortimer asked if it was possible to donate some or all of the funds to the charities Gibson had promised money to. “In that way, some good might still come for the vulnerable people, and the organizations supporting them, which were indirectly drawn into this unconscionable sequence of events."